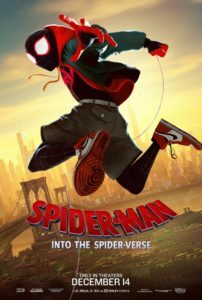 I saw Spider-Man Into The Spider-Verse for a second time last night. I loved it more that the first time, and I’ll probably love it more the third. The thing is…this is not only the best Spider-Man film ever, but it’s easily in my top three hero films of all-time, AND it might be in my top three animated films of all-time. It’s not difficult to see what’s so good about this film. The animation is next level! I read a social media post that stated that from this movie on, all hero films should be animated. I’m going to have to agree. Seriously, this film is able to do so much with the limitless boundaries of animation, that it seems funny to me that someone would pay an actor to do anything but voice-act a character. I’m not an animation major, and I’m having a bit of a struggle finding the words to fully explain why the animation is so damn cool, but if you’ve seen this film, you understand. It looks unlike any animated film you’ve ever seen, and the art direction of Dean Gordon and Patrick O’Keefe should land them all the awards. Seeing this the second time, I was even more impressed with the pacing of the story. We start with the death of our current universe Peter Parker and high schooler Miles Morlaes being bitten by an altered spider. Now feeling the stress of picking up the mantle, Miles buys a Spider-Man Halloween costume and does his best to adapt. Due to a rip in the universe as Kingpin attempts to bring back his deceased family, five other Spider-People show up in Miles’ universe, and they form a team to right the universe that Kingpin has altered. But even with all of these characters floating around, the story never feels rushed, and none of the characters feel like a side-note. It’s quite impressive. The layering of story in this film over the two-hours is textbook. Heck, I might be studying this movie in my film class next semester. The voice-acting talent in the film is note-worthy as well. Just check out the IMDB page to see the litany of stars giving life to the characters in this film. It’s bonkers, and each of the actors gets lost in the character, meaning…I never hear Nicolas Cage…I hear Spider-Noir. John Mulaney as Spider-Ham might be the exception, but he’s funny I don’t even care. And that’s another thing about this film that I loved: the humor is legit and blends with the dramatic beats. These characters had me laughing and getting choked up, at times, minutes apart. And finally, let’s chat Miles. I make no mistake that I love Miles Morales; he’s my favorite Spider-Man. And this movie solidifies that even more. But make no mistake, this movie focuses on the importance of Peter Parker as spider-founder and mentor. Miles has interactions with two Peter Parkers; one having the title for about 10 years and one for over 20. They are both amazing characters and help Miles find his place in the world; a place that not only exists alongside the other Spider-People in the multi-verse, but establishes itself as an important part of that world. Mile shows us what it means to be a hero, following in the steps of giants before us. He shows us that taking a leap of faith for the goodness of others is paramount. Inspiring and both physically and metaphorically beautiful, Spider-Man: Into The Spider-Verse might be my favorite film of 2018. This world is tough. This film makes it less so.